Clarksville, TN – Four members of the Austin Peay State University women’s basketball team recorded double-digit point totals, Wednesday, leading to an 85-62 victory over SIU Edwardsville in the Dunn Center. The Governors were led by senior center Tearra Banks, who totaled a game-high 19 points, but it was the additional offense around her which ultimately proved to be the difference. Senior forward Beth Rates was perfect from the field at 6-for-6, leading to 14 points, junior center Brianne Alexander added 14 points and sophomore Keisha Gregory had a milestone performance – posting the first double-double of her career (13 points, 10 rebounds). The 85 points scored by APSU are the most in regulation since Jan. 20, 2016 at Morehead State. On Wednesday, the Govs were strong on both ends of the court – shooting 51.7 percent as a team while holding the Cougars to 29.8 percent. 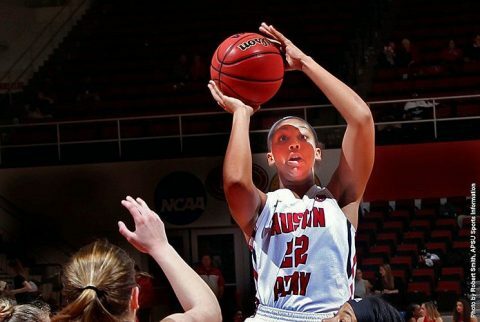 Ten different APSU players scored on the night, helping lead to the wire-to-wire victory. The win for Austin Peay snaps a six-game losing streak against SIUE, becoming its first victory in the series since 2014. It’s also APSU’s first OVC win inside the Dunn Center this season. With her 19 points, Banks is now just 14 points away from passing Ashley Herring for 13th all-time in Austin Peay scoring, currently with 1,169 career points. The performance is also her 12th-straight game to post double figures. Rates was one free throw away from being perfect in all areas, Wednesday. She also recorded four blocks in the contest to move within five from overtaking Ashley Haynes for third-most in program history. For Alexander, it’s the fifth time in 2016-17 to reach 10 or more points in a single-game. Seven of the junior’s points came at the free throw line. Gregory matched her career-high points total with 13 courtesy of three three-pointers, and also grabbed a career-best 10 rebounds in the win. APSU allowed the Cougars score just 10 points in the opening quarter, the lowest allowed in a first period this season. Austin Peay had an assist to turnovers ratio of 18-13. The Governors never trailed in the contest. Austin Peay makes a trip to Eastern Illinois for a road matchup against the Panthers, 1:00pm, Saturday.